Slovenia began erecting a razor wire fence along parts of its border with Croatia on Wednesday, saying it wanted better control over a tide of migrants flowing through the tiny country en route to other areas of Europe. The continent is grappling with its biggest influx of migrants - more than one million are expected this year - since World War Two and is deeply split over how best to respond. Around 180,000 people, many fleeing war in Syria and Afghanistan, have streamed into Slovenia since mid-October after trekking northwards along a Balkan corridor from Greece, most of them bound ultimately for Austria and then Germany. Slovenian army trucks loaded with wire fencing arrived in Veliki Obrez, a village on the southeastern border with Croatia, early on Wednesday. By 1400 GMT, over 1 km (mile) of wire had been strung up, a Reuters photographer there reported. "The barriers do not have the purpose of preventing arrivals to Slovenia or significantly reducing them... Their purpose is to direct the flow of migrants to controlled entrance points," Boštjan Šefic, state secretary at the Slovenian Interior Ministry, told a news conference. He said that a total of 1.5 km (0.9 mile) of fence had so far been erected along two locations on the border but declined to reveal how many more kilometers would be fenced off. The main point of disagreement in the EU is over mandatory national quotas to share out asylum seeking refugees and migrants among the 28 member states. Hungary, whose anti-immigrant government shut its border to arriving migrants in October, as well as the Czech Republic, Poland and Slovakia deeply oppose the quotas. Slovenia is facing more pressing logistical concerns. Prime Minister Miro Cerar said on Tuesday that the ex-Yugoslav republic, the smallest on the migrant route, lacked the resources to shelter large numbers over the harsh winter if Austria closed its border as well. Slovenia's boundary with Croatia will remain open, Cerar said, but the fence will prevent migrants entering the country at uncontrolled points along the frontier. Croatians on their side of the border were doubtful. "When a large number of people start pushing they are like a swollen river, and I don't think this (fencing) can stop them," said Željko Poljak, a resident of the village of Vukovo Selo. 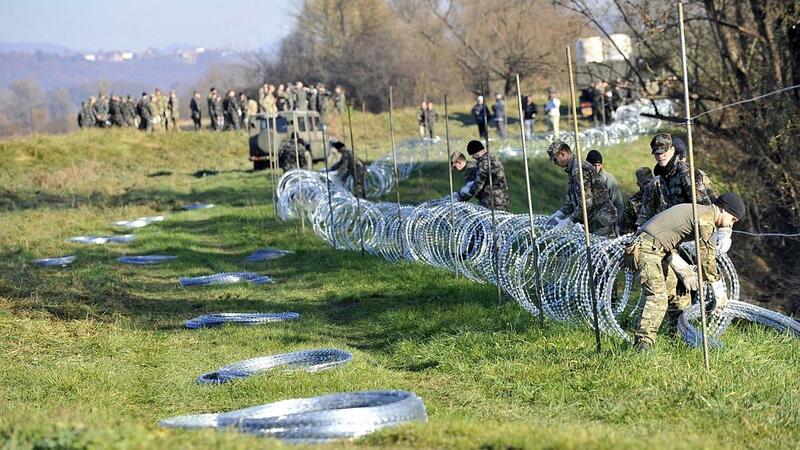 Slovenian soldiers also erected several 100 metres (yards) of wire fencing in an open field near the border village of Gibina in eastern Slovenia, a Reuters cameraman there said. No migrants were present at either of the two places, but large numbers of soldiers and police were there, some guarding construction equipment. Croatia, like Slovenia an EU member but outside the bloc's Schengen zone of passport-free travel, on Wednesday said Slovenia's move was unnecessary and a waste of money. "It would be better if they built reception centres, similarly to what we did," Croatian Interior Minister Ranko Ostojic told reporters. "No wire can stop people to find their way and it is better to make their way organised." Slovenia said this week it was not going to build any long term reception centres. Croatian police sources said later on Wednesday that Croatia asked Slovenia to dismantle part of the Slovenian fence because it went through Croatian territory. Slovenia's interior ministry had no immediate comment. Although Slovenia and Croatia both declared independence in 1991 from then-federal Yugoslavia, some sections of their common 670-kilometer (415-mile) border between the two states remains undefined. The U.N. refugee agency UNHCR said more than 3,000 people were waiting to enter a refugee camp at Presevo in southern Serbia, from where they would probably make their way north to Croatia and then Slovenia like tens of thousands before them. Another 3,000 people were expected to enter Serbia from Macedonia on Wednesday, and 9,000 arrived a day earlier, a UNHCR field officer in Presevo said.